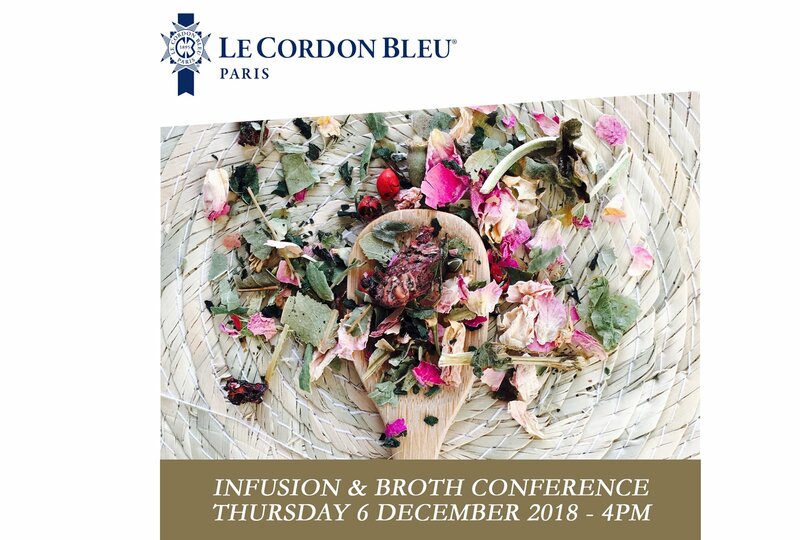 December 2018 - Broths (bouillons in French) and infusions will be in the spotlight on 6 December at Le Cordon Bleu Paris institute during a presentation by Chic des plantes! company. Two experts in the tea and infusion field, Laura Guillemin and Carine Baudry, will provide an insight into their gastronomic sphere during a conference which will take the form of an open discussion. The event will include tastings of creations made on the theme of broths by Le Cordon Bleu Chef Instructor Christian Moine. Broth, a simmered aromatic liquid combining meat, fish, shellfish or vegetable residues and cooking liquid, concentrates and exalts flavours. It is considered to be one of the cornerstones of French gastronomy. At the beginning of the 20th century, its success was such that it lent its name to leading Parisian institutions. Bouillons Chartier or Racine, to name but two, became popular eating establishments where soup provided both sustenance and a means of coming together. Today, broth is still used as a base for sauces, jus and veloutés by the very best chefs. Infusions made using plants use the same process as that used for making broth. The value here is both for taste and medicinal purposes, as advocated by oriental medicine for thousands of years. Chic des plantes! has taken inspiration from these extraordinary virtues but has brought them to the modern era whilst taking environmental issues into account. This innovative company also develops its creations, thanks to partnerships with chefs, such as Amandine Chaignot, former chef of the Rosewood Hotel in London.